François VOUGA, An die Galater, (HZNT 10), Tübingen : Mohr Siebeck, 1998. 24 cm. VIII-162 p. ISBN 3-16-147002-8. Gregory K. BEALE, The Book of Revelation, (The New International Greek Testament Commentary), Grand Rapids/Carlisle : Eerdmans/Paternoster Press, 1999. 24 cm. LXIV-1245 p. ISBN 0-85364-851-4. $ 75. Etienne NODET, Flavius Josèphe : Baptême et résurrection, Paris : Cerf, 1999. 20 cm. 255 p. ISBN 2-204-06174-3. FF 135. Alphonse MAILLOT, Un Jésus. « Vous qui dites-vous que je suis ? », Paris : Lethielleux, 1995. 22 cm. 318 p. ISBN 2-283-61022-2. FF 140. Odette MAINVILLE (éd. ), Écrits et milieu du Nouveau Testament. Une introduction, (Sciences bibliques. Instruments 7), Paris/Montréal : Médiaspaul, 1999. 22 cm. 290 p. ISBN 2-89420-177-X. Craig A. EVANS, Stanley E. PORTER (éd. ), New Testament Backgrounds. A Sheffield Reader, (The Biblical Seminar 43), Sheffield : Academic Press, 1997. 24 cm. 335 p. ISBN 1-85075-796-8. Simon Claude MIMOUNI, Le judéo-christianisme antique. Essais historiques, (Patrimoines), Paris : Cerf, 1998. 24 cm. 547 p. ISBN 2-204-05937-4. FF 300. COLL., Pour lire les textes bibliques. Collège et lycée, (Argos démarches), Créteil : CRDP de l’Académie de Créteil, 1998. 24 cm. 270 p. ISBN 2-86918-089-6. FF 100. Stanley E. PORTER, Jeffrey T. REEFD (éd. ), Discourse Analysis and the New Testament, (JSNTS 170), Sheffield : Academic Press, 1999. 24 cm. 425 p. ISBN 1-85075-996-0. Stanley E. PORTER, Dennis L. STAMPS (éd. ), The Rhetorical Interpretation of Scripture. Essays from the 1996 Malibu Conference, (JSNTS 180), Sheffield : Academic Press, 1999. 24 cm. 394 p. ISBN 1-85075-959-6. £ 57,50/$ 95. Louis PANIER (éd. 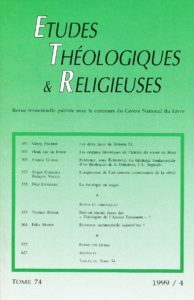 ), Les lettres dans la Bible et dans la littérature, (LD 181), Paris : Cerf, 1999. 21 cm. 337 p. ISBN 2-204-06274-X. FF 185. David G. HORRELL (éd. ), Social-Scientific Approaches to New Testament Interpretation, Edinburgh : T&T Clark, 1999. 22 cm. 426 p. ISBN 0-567-08659-5. £ 14,95. I. A. H. COMBES, The Metaphor of Slavery in the Writings of the Early Church. From the New Testament to the Beginnings of the Fifth Century, (JSNTS 156), Sheffield : Academic Press, 1998. 24 cm. 210 p. ISBN 1-85075-846-8. David Laird DUNGAN, A History of the Synoptic Problem : The Canon, the Interpretation of the Gospels, (The Anchor Bible Reference Library), New York/London/Toronto/Sydney/Auckland : Doubleday, 1999. 24 cm. 526 p. ISBN 0-385-47192-0. $ 39,95. Geert VAN OYEN, The Interpretation of the Feeding Miracles in the Gospel of Mark, (Collectanea Biblica et Religiosa Antiqua IV), Brussel : Koninklijke Vlaamse Academie van Belgie, 1999. 26 cm. 252 p. ISBN 90-6569-681-4. Sven K. SODERLUND, N. T. WRIGHT (éd. ), Romans & the People of God. Essays in Honor of Gordon D. Fee on the Occasion of his 65th Birthday, Grand Rapids : Eerdmans, 1999. 24 cm. 311 p. ISBN 0-8028-3861-8. $ 35/£ 22,99. Victor Paul FURNISH, The Theology of the First Letter to the Corinthians, (New Testament Theology), Cambridge : University Press, 1999. 22 cm. 167 p. ISBN 0-521-35807-8. £ 32,50/$ 49,95. Bernard GILLIÈRON, Pour l’amour de Corinthe. L’apôtre Paul dicte ses souvenirs, Aubonne : Moulin, 1999. 18 cm. 89 p.